There are some life skills that we are bound to learn – like reading and writing, riding a bicycle and basic maths. There are some other things that are usually not on any curriculum but are well worth investing the time in learning. Twenty of so of the most useful Windows (computer) shortcuts. There’s a long list here. There are plenty more candidates that come to mind – for example, the skill of public speaking, or a good basic knowledge of human nutrition or of human fertility. The list, once you get into it, seems endless. However the above are my first eight. Some of these I was lucky to learn early in my life, some I learned later and two – to my chagrin – I never mastered. I certainly wish I had, and really I still should. I’d suggest you choose one today, take the time and learn it. You can learn most of these from Youtube these days. What other life skills should be added to this list? This entry was posted in Uncategorized on July 10, 2013 by Simon Rees. 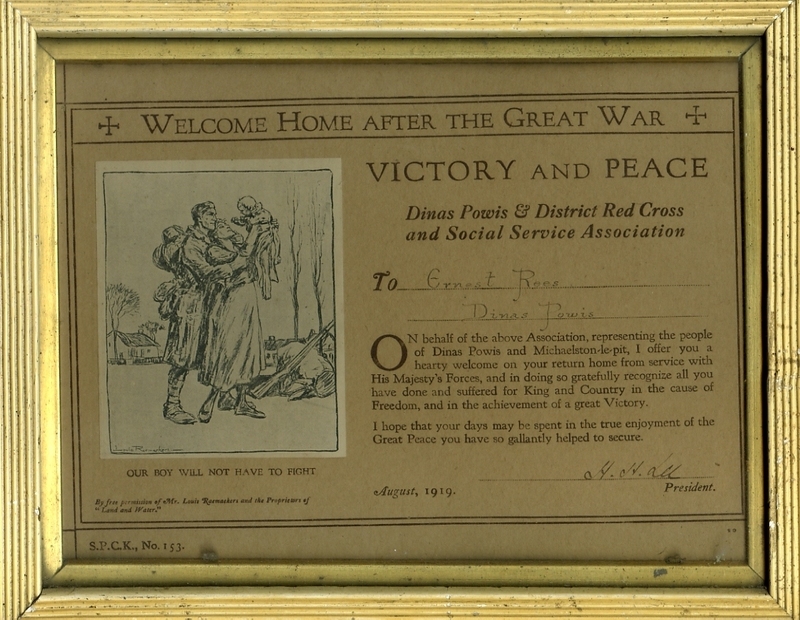 This certificate was given to my uncle Ern (an older brother of my paternal grandfather) after World War 1. Uncle Ern was gassed in the war and never regained his health. The saddest thing is that if Uncle Ern had been coming home to the wife and child in the picture (he was unmarried at the time), the boy in arms would almost certainly have been drafted to fight in the war that followed 20 years later. I was privileged to be at a breakfast meeting in Brussels addressed by the President of Ireland at the time, Mary McAleese. At it she described the European Union as ‘the greatest conspiracy for good in history’. This continues to resonate with me – since the European Coal & Steel Community (forerunner of today’s EU) was created in 1951, we have had no war in Western Europe. Long may it remain so. So though I’m deeply grateful to my forebears for their sacrifice in protecting us from aggression, I’m yet more grateful to the politicians who, since 1951, have made it more and more difficult to fight a war in Europe. With Balkan nations queueing up to join the EU, perhaps we can finish with war in Europe for the foreseeable future. And finally, in what seems to me like a bad joke, you may notice that the certificate was published by SPCK – The Society for Promoting Christian Knowledge. I guess things were different then. This entry was posted in Uncategorized on November 11, 2012 by Simon Rees. 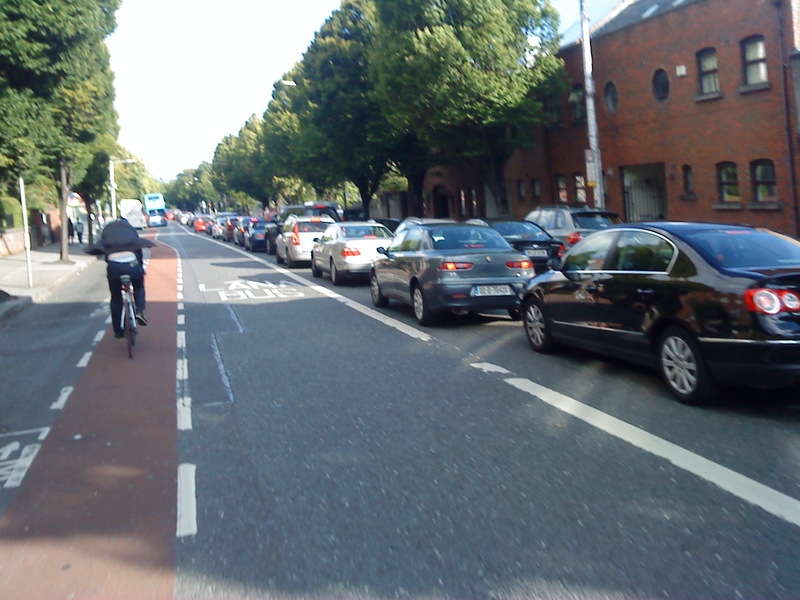 As I locked my bike at the shops one evening on the way home from work recently a chap on another bike pointed to the slow-moving cars on the N11 and announced ‘they’re all mad, them fellas’. He proceeded to give me a hymn of praise to the bicycle. He’s right, of course – the bicycle is good for the environment, good for your physical health (even talking into account the risks of being knocked off by a motorist) and good for road congestion. For me, it’s good for the soul, too. When I’ve cycled to work I have more energy, get more done and am more cheerful. Mind, I need to eat more because there’s nothing for nothing – my legs have done the work of the 46A bus. Still, there’s plenty money saved even after the occasional new tube, tyre or set of brakes. If you live in Dublin you won’t fail to notice the increase in the number of cyclists of late. Usually I give up the bike around this time of year, till March – the cold and dark make the cycling no fun for me. Next spring I plan to do the intermediate bike maintenance class at Cafe Rothar, so can service my own bike. Roll on the warm weather! This entry was posted in Uncategorized on October 22, 2012 by Simon Rees. The old site is gone and a new one will emerge, queen bee-like, from her cell shortly. Watch this space! This entry was posted in Uncategorized on July 6, 2010 by Simon Rees.